Michael Schmidt in front of the Walkerton Court House at an earlier stage of the Obstruction trial on August 25th, 2017. 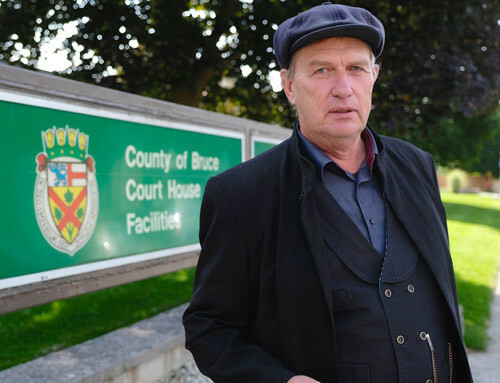 Raw milk activist and farmer Michael Schmidt was convicted yesterday (Oct. 19th, 2017) in Walkerton court of obstructing a peace officer. The charge arises from a raid on Glencolton Farms on October 2nd, 2015 in which investigators were prevented — by the crowds of supporters — from leaving the farm with equipment which they had seized. They were eventually allowed to leave once the equipment had been removed from the truck. This court case has dragged on for many weeks and months, with multiple adjournments, most recently until this past Tuesday Oct. 17, when Michael Schmidt filed an 11b motion to have the case thrown out, since it was taking an excessive time to have justice rendered. In considering Michael’s motion, the judge discounted several months of time required to hear the 20 defense witnesses, on the basis that their testimony had been useless. Blackburn News is reporting on this story. The Dock reported on the story. Owen Sound Sun Times coverage can be read here.